Taking a (momentary) break from Dave Brubeck and Paul Desmond, here’s another college concert album, this time recorded on the Best Coast in California. 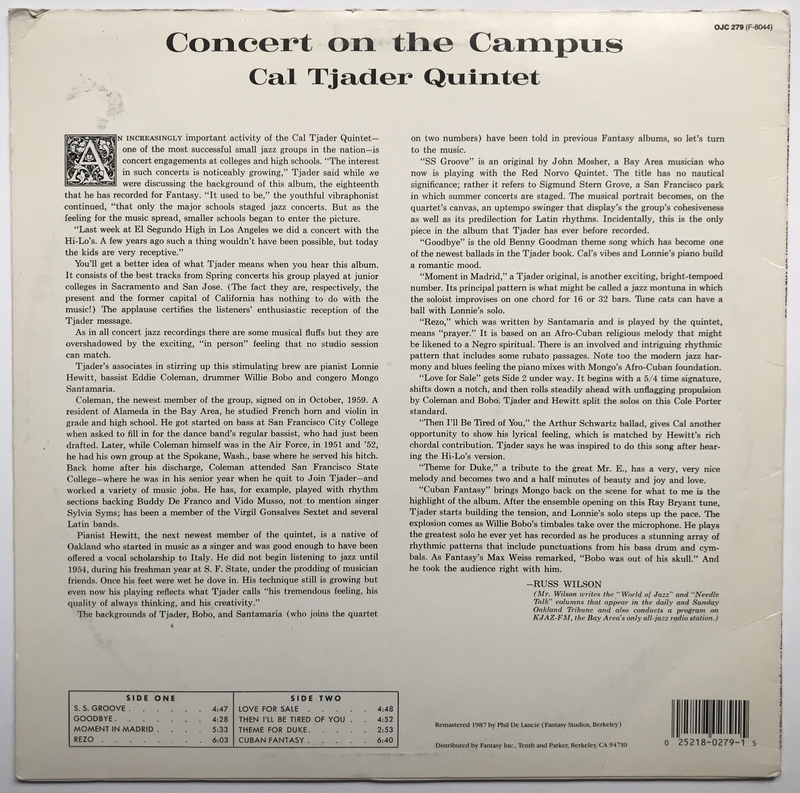 Following the example of his one-time leader Dave Brubeck (told you it was momentary), Cal Tjader took his good vibes directly to the students via college appearances. Luckily, Fantasy had a microphone connected to a tape recorder. With the apparently wild success of Cal Tjader during the 1950’s and 60’s, Scott Yanow, our resident scholar in residence, gave a lukewarm review. He concedes that Tjader “expertly balances between cool jazz and Latin music” while using the adjective “fine” to describe the music itself. He gave the album four stars though, so apparently he thought the music was REAL fine. It’s certainly a swingingly solid Tjader album, full of simmering music. There are numerous reasons why this album’s cover art garnered an ‘A-‘ rating from the staff here at Raggy Waltz headquarters. First, if you’re going to record an album on a college campus, why wouldn’t you put the famous statue ‘The Thinker’ front and center on the cover? You’d be crazy not to. Secondly, having the band members mimic the statue IN FRONT of the statue is nothing short of brilliant. Ok, maybe not brilliant, but delightfully kitsch. By the looks of his smirk, Cal Tjader appears to be in agreement with me. In spite of that, though, it’s a delightfully kitsch concept that works here. Thirdly, the fact that Fantasy was liberal enough to include a full-color photograph of Tjader’s almost full-color band is a pleasant and thought-provoking move. In 1960, the year of the first sit-ins by black Americans to desegregate restaurants and diners, the sight of an integrated band was a controversial thing. Kudos to both Tjader and Fantasy for going against the societal norms. Russ Wilson, a well-known jazz critic and writer of the Bay Area, brings us the liner notes. They do the job, briefly discussing the music and giving bios of some of the band members. Of course, this being a Fantasy record, there’s no information on the album jacket about the date the music was recorded. 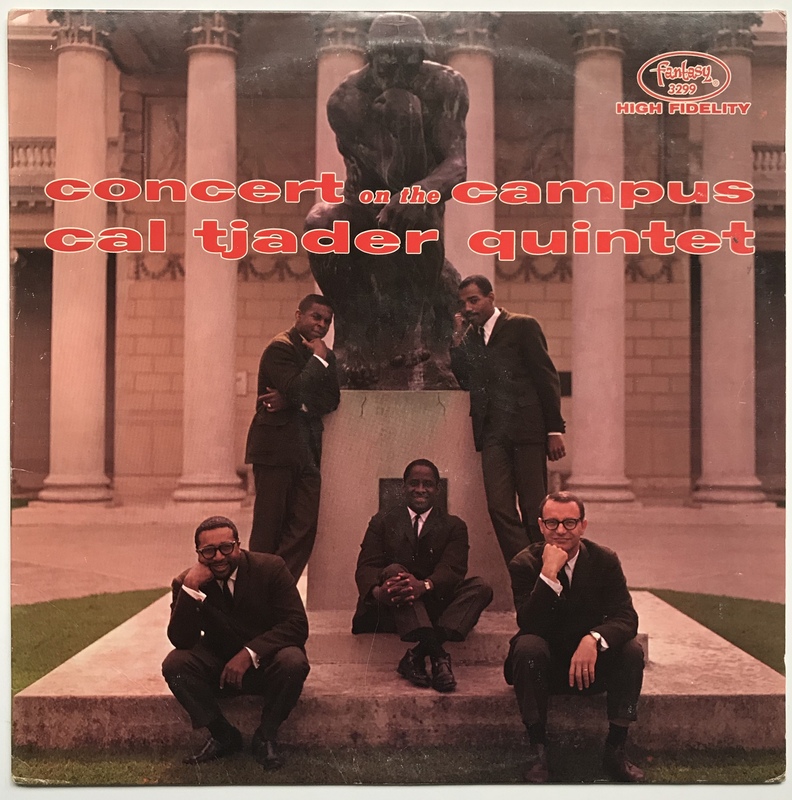 All we get is a sentence from Mr. Wilson about the music on this album coming “from Spring concerts his group played at junior colleges in Sacramento and San Jose”, which according to Cal Tjader’s biographer is wrong. My album is a 1980’s reissue, so they should’ve added the recording information. If a former employee of Fantasy Records happens to stumble upon my blog and see my comments, know that my critiques and grievances are all in jest. Mostly! In a nod to its early days, Fantasy released this album on translucent red vinyl, with modern blue labels. The thin vinyl and lack of a deep groove point to its 1987 manufacture date. The ink machine appears to have been on its last leg, all but dying on the second label. Pressed in stereo, the sound mix is spacious, indicative of what was probably a large performance hall. Having been remastered for the reissue, I’m curious to know what the original mix sounded like, a this remastering job leaves much to be desired. Why is the piano way to the right while everyone else is more or less in the middle and nobody is over on left? Even the applause is absent in the left channel. Weird. Good old eBay, the prize of a ‘buy now’ option. I don’t remember how I heard about this album, but the cover art and the inclusion of “S.S Groove” piqued my interest. Bought in the early days of my vinyl fascination, I didn’t bother to read if it was an original or not, nor did I really care. I suppose I still don’t, but if I happen to see an original pressing in the wild, I just might have to grab it.